John Llambes is an experienced and skilled 1st Assistant Camera and focus puller. Since the beginning of his studies John was fascinated by the power of cinema and the wide spectrum of possibilities of modern digital technology, so a career as a 1st Assistant Camera was a natural fit. 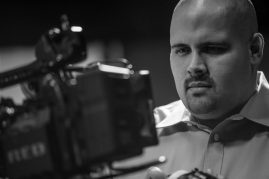 He graduated with a Bachelor in Arts from Miami International University of Art and Design and since has been working to improve his craft and grow professionally as both a Camera Assistant and a Camera Operator. In 2008 he started to work side by side with Randy Valdes and over time became an integral member of GlassWorks Multimedia. John aspires to be a cinematographer and is using his time working with some of the best and most experienced Directors of Photography to gain experience that will one day help him make the transition. Advice From a U.S Olympian: The Moment That Makes It All Worth It with David Boudia and Jordan Windle. Stories from the AT&T Network. Spectrum of Hope is the story of 10 musical theater students, their families, and their teachers as they go on a journey from their special needs school in New York City’s Lower East Side to the Junior Theater Festival in Atlanta, Georgia. It is a beautiful moment in all of their lives – a celebration of the power of arts education, musical theater, and what can be accomplished when students are allowed to flourish on their own terms. P94M – The Spectrum School – is part of the NYC Department of Education’s District 75, which is dedicated to educating students with special needs. It is the only District 75 school dedicated to the performing arts – and it was once a school in crisis. Students at P94M come from diverse backgrounds – Hispanic, Palestinian, Nigerian – and their challenges are as unique as they are.